You may stumble upon useful pages sometimes that have such an irritating design or page style that you have a hard time concentrating on the content that it offers. Maybe it is the blue text on the dark background, or lots of whitespace that hurts the eyes, or links that you cannot distinguish from text. You can run into many different usability issues on the Internet in regards web page accessibility. Update: Change Color is no longer available on the Store. You can try the Chrome extension Midnight Lizard instead which offers similar capabilities. The Google Chrome extension Change Color offers a solution. Unlike bookmarklets that only work on the active page, it can override styles permanently. When you install the extension for the first time, you will notice a new icon in the Chrome address bar which indicates that the extension is ready for use. A click on that icon displays three options: you can either apply the page style override to the active page, the domain or all websites that you visit. 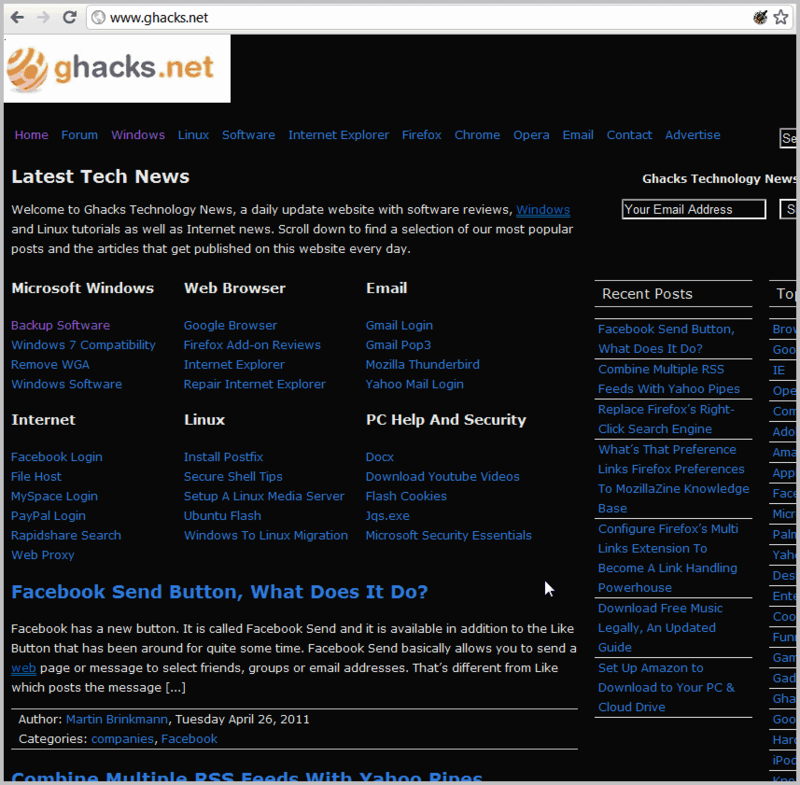 Page and domain can be interesting, considering that you may encounter different page layouts on the same domain, which is for instance the case for the Ghacks homepage and the forum. An option to change the page style for a subdomain or a specific directory is missing and would certainly be useful. The default colors may not be to everyone's liking. The background is changed to black, the text color to white, the links to blue and the visited links to violet. 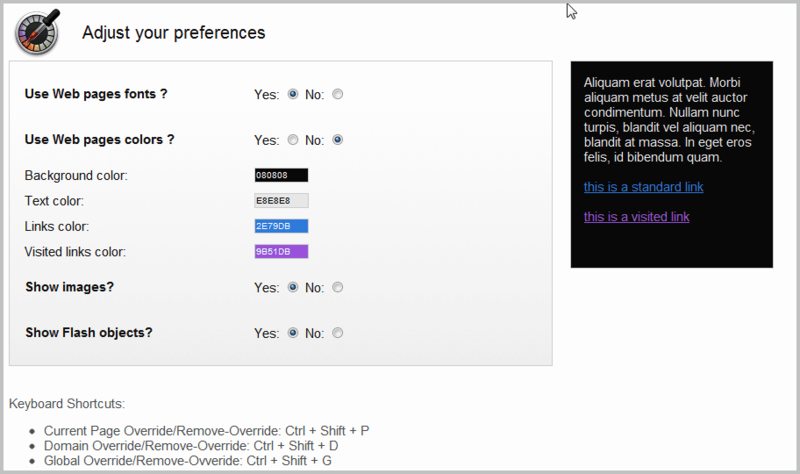 You can change all colors, and a handful of additional options in the extension's preferences. You can change background, text, link and visited link colors with a click on the color in the preferences, or by entering a color value directly into one of the forms. What's missing is an option to only override one of the colors and keep the remaining colors by default. The extension does not change the font used to display the textual contents on the page or website by default. This can be changed in the preferences as well. You can select any available system font instead which is then used to display the text on the web page. It is furthermore possible to change the font size, disable images and Flash objects via the preferences. The changes are visible immediately and I suggest you open two Chrome windows next to each other to work on the replacement style while you have the preferences menu open to make adjustments. That's easier than having to switch tabs to see how the changes look on websites. Change Color comes with keyboard shortcuts that enable or disable the page style override. Ctrl-Shift-p, Ctrl-Shift-d and Ctrl-Shift-g enable or disable the override on the current page, domain or globally. The extension is available for download on the Chrome Web Store. Tip: You can use the Override function of Chrome's Dev Tools to make permanent changes to websites as well. Also es scheint als ob die Seiten von Chromium/Chrome selbst “immun” gegen die Beeinflussung durch die Erweiterung sind. Wenn man jetzt z.B. wüsste, wo im Sourcecode das genau festgelegt wird könnte man den Chrome mit der Wunschfarbe noch mal kompilieren…. übersteigt aber leider derzeit meine Sachkenntnis… sicher wird es doch einfachere Mittel und Wege geben, auf JEDER Seite das grelle hell generell weichen zu lassen ??? This is a wonderful extension. It might be old, but it still works well on latest stable Chrome under latest stable Windows 10.
this extension was WONDERFUL – I enjoyed it for years, but it stopped working for me recently. (It would do nothing but close override on every page and domain.) I thought, then, if I removed it from chrome then added it back, it might start working again. But it is now nowhere to be found, not in chrome store, not on the web, NOWHERE! I am so unhappy! I used this extension for years and enjoyed every minute of its simplicity. PLEASE, can someone tell me how I can retrieve it. Did the name change; was it simply pulled from the universe…what?? If anyone knows if this app is still in existence, could you please tell me where I can find and download it again. I enjoyed it more than anything on my computer…… I would be so grateful. stupid Google, it removed in Chrome 67!!! The link I wrote in 2017-12-12 above still works for at least Opera and Avast Secure Browser. It fails in Chrome 67.0.3396.62 beta (64 bit) after you attempt to install it, with Details “invalid manifest”. I reported it to Google but I am not optimistic for a solution from them. Same problem, none of the alternatives are as good as Change Colors, why is it broken with Chrome all of the sudden? I have also used the Change color extension for years, I need black background because of a poor eye condition, and just as mentioned before, there are no extension that works as well, believe me, I have tried them all! I use chromeboxes and chromebooks both for my company and in private, but I might need to change them all, to another platform that works for me, now that the Change color extension is gone. Windows have a really well working “high contrast” mode, that is excellent, but Windows OS are not that stable and needs more caretaking to work well in the long run. Does anyone knows. if there is a well working feature in MAC products, that can change colors and make backgroung black, text/links white/yellow or similar? The inverted colors option in Chrome does not work, because it also inverts pictures, and I work with webshops and trade. Easy Invert from https://www.wintools.info/index.php/easy-invert is both better and worse than the old Change Colors extension which is not available anymore, especially if you use current Google Chrome. I have found Easy Invert (not an extension and not installed but just run once) to be a great alternative to Change Colors. It is conceptually a different design that can be very useful, after you get used to its capabilities by playing with its options. now i see 404. That’s an error. Unfortunately not. I have edited the article to reflect the removal and added an alternative that works similarly. I hope the author is not dead. Still not sure why it was removed from the store. Nothing to do with the C-version. It’s just gone. if anyone can get change colours to work or something similar please let me know. been using change colors for years and had difficulty finding it when my computer has updated and deleted it. ive tried midnight lizard which isnt as easy to use, and its not changing the colour of the background its changing the hue of the page, therefore things like tabs at the top of web pages change with the hue, making that part impossible to read. it seems you have to sacrifice the ability to read one thing to be able to read another, whereas with change colours you didn’t have to do that.